All meetings are closer than they appear in the rear view mirror, and the gala event of the car show season, the April 21-22 “Brits on the Bay” Welcoming Party and Car Show, is rapidly wending its way, soon to be upon us. 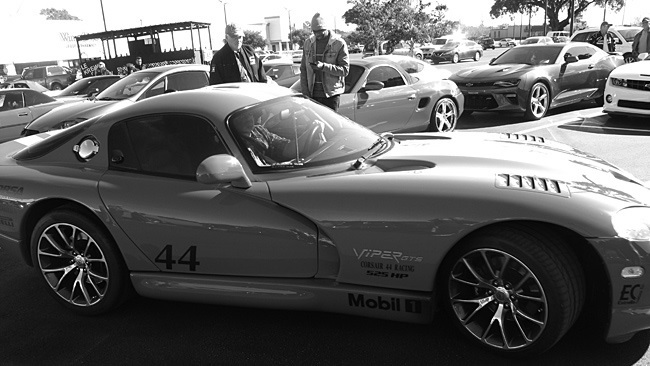 It will strike like a viper if we are not all ready and, most importantly, if you are not there. This is the 25th Anniversary Show, and PBCA is making every effort to make it a show that you can tell your grandchildren about. We, the Show Committee and many others, started work about October, and have been working assiduously, with a minimum of monthly meetings and several call meetings. Those of you who have been part of putting on a car show know the multiple tasks, small and large, that must be attended to. We faced an especially challenging one when the nearbayfront site we have used for several years, free of charge due to the generosity and courtesy of the Mouton family, became unavailable. Regrettably for us and wonderful for them, they recently sold this beautiful several-acre, old-oak-tree-adorned wonderland, so we became vagabonds, searching for a place to put down our roots. Fortunately, through help from many, especially PBCA member Bill Weeks, we were able to rent the cityowned Seville Square, an equally tree-lined venue. The expense was considerable, but it neatly meets our needs, though it is a smaller site. This reduction of size called for some skillful and successful planning, led by member Marc Cherry. Members who are interested in volunteering for show date are encouraged to contact Marc at redshirt98@ att.net or (520) 237-0285. The festivities start with the Welcoming Party, beginning at 6 p.m. at the Museum of Commerce, at 201 E. Zaragoza St. in Pensacola. 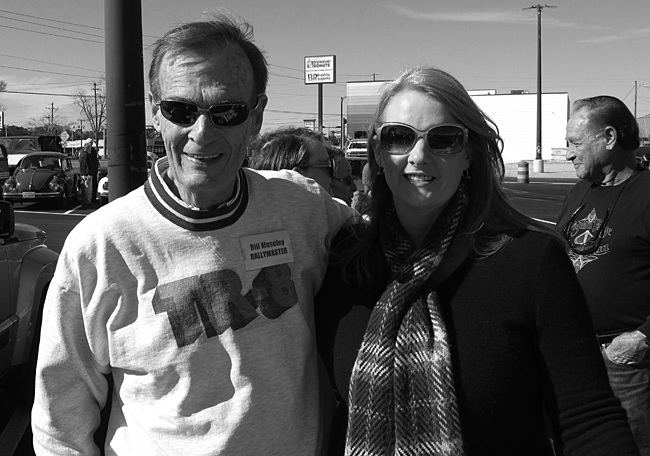 Many hands are working on this event, led ably by Bob Manske and Liz Maynard. The food and drink will be voluminous, the friendship warm, and the entertainment high in quality. All our friends from nearby clubs, out-of-town visitors, and sponsors are welcome with open arms. The “Brits on the Bay” Show registration is at 8:30 a.m. at Seville Square and for the public at 10 a.m. While one can never be sure of attendance, over the past few years we have averaged about 130-150 cars and a large crowd of visitors, and we hope to exceed that in 2017. One can pre-register (forms available at website www.pbca1. com) or register upon arrival on site. The website also has information on hotel registration. We have planned our early morning car wash at all the hotel sites listed and our special goody bags for the event, and have included our mainstays, the “Not Quite Fab” Beatles homage band, our terrific silent auction and 50/50, and an array of the beautiful British cars that we all take such pride in. Due to city regulations, we will not be selling our great food from the PBCA Café, but are fortunate to have several restaurants available across from Seville Square. But all this comes to naught if you are not there, so please mark your calendar with those dates, April 21-22, and don’t be among the missing come Friday and Saturday. See you there. January 21 — Snowbird Festival, Orange Beach, Ala., saw rainy weather — but many snowbirds were not discouraged by a little rain, being accustomed to winds and rough weather. Attendance was a bit off but still several hearty PBCA members attended. 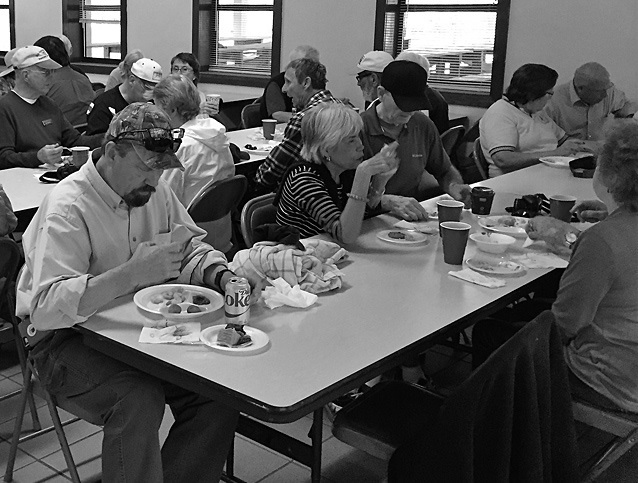 January 22 — The Chili Cook-off at the Spanish Cove Clubhouse had to be cancelled. Maybe later. January 27 — Fancy Friday on the Town saw about 13 gourmet diners at Kazuko’s Japanese Restaurant for a truly extraordinary meal, and at prices that delighted the pocketbook. Hard to know how they do it. 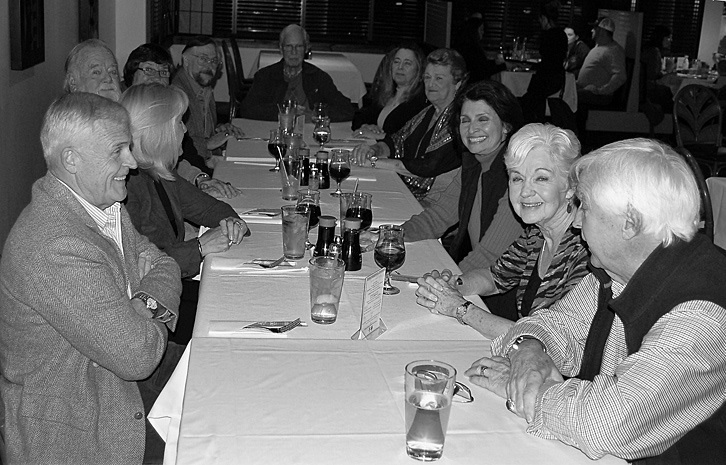 The March 31st event will be at Bonelli’s Italian Restaurant, a delightful venue. Details will come via e-mail. 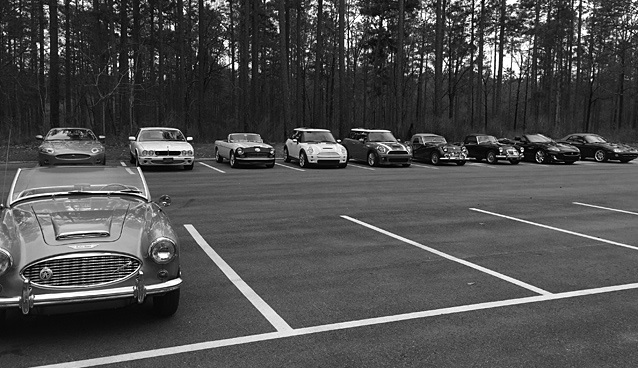 February 4 — The Pensacola-Atmore Rally, with our own Bill Moseley in a key role, saw a great turnout of all marques for a delightful drive through rural Florida and Alabama, followed by lunch at Dave’s Catfish House. Thanks, Bill, for all your help. See page 15 for more. February 7 — Breakfast at the Grand and Show Committee meeting, where attendees enjoyed great food and companionship, followed by work on the great 25th Anniversary Show. Plans are proceeding well. February 11 — Shrimp Boil at Bear Lake, where Mickey and Kay Kay did their usual excellent feast for some 45 PBCA members and friends. It is a beautiful setting and great food, a winning combination. Thanks to the Kays. February 15 — PBCA Executive Committee met at noon at the Grand to continue the work of the club. February 20 — PBCA monthly meeting at Sonny’s on Navy Boulevard at 7, which was especially important because of upcoming show. 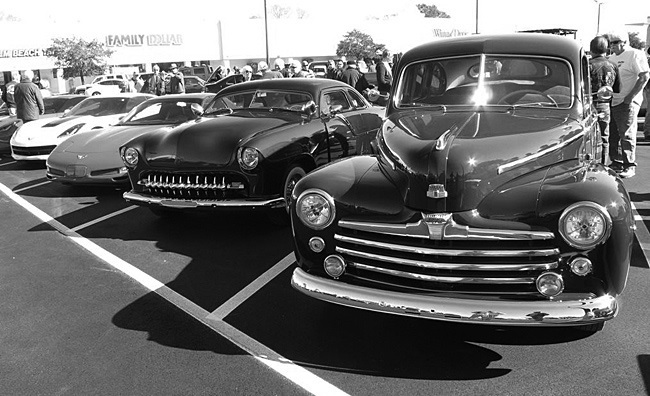 March 4 — Panama City Car Show. Details via e-mail. March 7 — Breakfast at the Grand. Food and friendship at 10 a.m.
March 15 — PBCA Executive Committee meeting at the Grand at 12 noon. 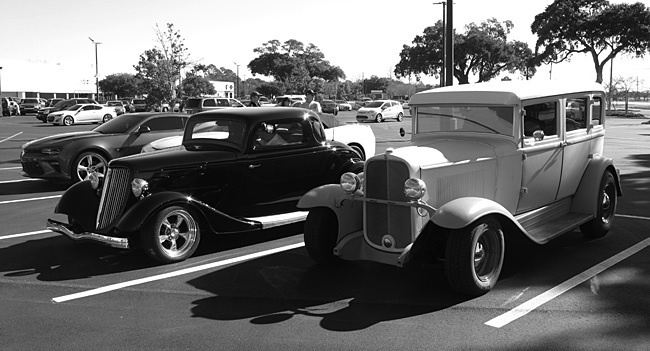 March 18 — Fairhope Arts and Crafts and Car Show. Details via e-mail. Until next time, not a good idea to mix starter fluid and a cigarette.